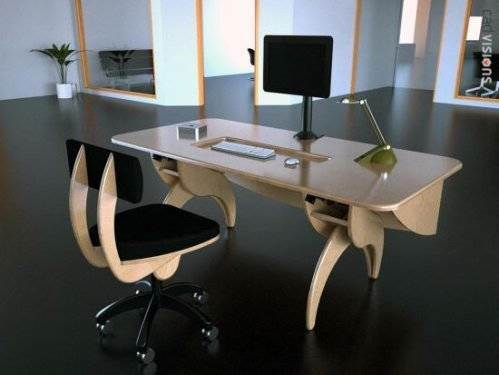 HiLo has released an ergonomic workstation with the intention of making working a tranquil and calm experience. The HiLo Workstation consists of a table, which can be ergonomically combined with a monitor stand and a chair to let you work more contentedly. The HiLo table comes in two chic shapes that have an integrated keyboard and is also height modifiable to make it suit people with different heights. The stylish looking workstation, which can be finished in either a light or dark brown lacquered finish, has enough space on its surface to hold a decent amount of office stationary or even a couple of knick knacks. The monitor stand is also fully adjustable for height. Completing the ergonomic package is aa excellent looking chair that has foam located in all of the right places to give you the best possible posture and also can be customized according to the users specifications. All these factors make the HiLo a very elegant, fashionable, and comfortable solution that will harmonize todays space age office cabins.